A. Santaella & Co., makers of Flor Mia, Optimo, El Capitan General, Alluro, Centropolis and Best of the Best was established in 1886 in Key West by Antonio Santaella (1863-1984), a Spanish immigrant from Seville who became a cigar maker in Cuba during the 1870s and Sol Hamburger (1857- ) a German immigrant from Aschaffenburg, Bavaria. Optimo was a very well known brand, its customers included Sir Winston Churchill and Babe Ruth as stated in this article of the Cigar City Magazine : "The Babe loved Tampa and personally visited the factory often to buy cigars and sign autographs." According to the document TAMPA’S HISTORIC CIGAR FACTORIES: MAKING A CASE FOR PRESERVATION by BRIAN KOEPNICK , A. Santaella & Co. moved to Tampa in February 1900 to a frame building previously occupied by the old Armina factory at 2202 N Howard Ave. By April 1900 they saw the need to expand and that summer they moved to a new brick factory building on the corner of Howard & Pine Street, this building would eventually be purchased in 1903 by the Leopold Powell Cigar Co. and later by the San Martin & Leon Cigar Co. when they acquired Leopold Powell Cigar Co. In March 1904, A. Santaella & Co. had outgrown this facility and moved to a brand new factory building at the same site of the existing building today, this building and their entire tobacco stock burned down in April 1904 during a fire that raged through West Tampa and destroyed several factories. To avoid a similar catastrophe, Santaella acquired all the properties in the the block where his burned down building was, demolished them all and built this 58, 650 sq. ft. building which opened in October 1904, at the time the largest cigar factory building in West Tampa and one of the better equipped in Tampa. 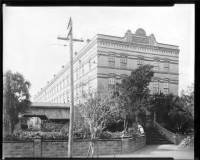 In 1905 a large 100 foot extension was added to the rear of the building making the factory the largest of its kind in the Tampa area. A. Santaella & Co. operated here until it was sold to the Universal Cigar Co. in 1955. Along the front and sides are the faded words "Southern Mill Creek Products Co." which at one time occupied the building. On December 14, 1969 the property was sold by Marnell Storage Corportaion, represented by Herbert Friedman, to A. C. Kotler and L. L. Falk. Then on on August 22, 1997 the factory was sold by Kotler and Falk to Ellis-Van Pelt, Inc., its current owner. In 2007, Ellis-Van Pelt, Inc. converted portions of the factory into the "West Tampa Center for the Arts" with the upper floors of the factory converted into lofts for artists to work in. The rest of the building is used for warehouse space and furniture clearance center. Throughout the building, the Ellis-Van Pelt families have saved and displayed cigar related artifacts that were found when they purchased the building. An interesting interview and tour of the building by W. Gray Ellis of Ellis-Van Pelt. Inc. can be seen in this YouTube video . Claims exist that the old building is haunted, in 2006 Tampa Ghost Watchers studied the building but their results were never posted.